The death toll from Hurricane Michael continues to mount as rescue and recovery crews work through the vast area along the coastline of the Florida panhandle and further inland that was laid waste by the gigantic storm, the third strongest ever to strike the mainland of the United States. The official toll was 18 as of Monday, when President Trump and his wife Melania visited the disaster zone briefly as part of a stage-managed political tour, where he stayed as far away from actual victims as possible, while praising his political ally, Republican Governor Rick Scott of Florida, and hailing the work of the Federal Emergency Management Agency. Trump actually flew over the disaster zone in an Air Force helicopter, but his political handlers ensured that there would be no photographs of the president looking down on the wreckage, which would evoke the indelible memories of President George W. Bush peering down through the window of Air Force One on devastated New Orleans after Hurricane Katrina. Trump and his wife then walked quickly through one wrecked neighborhood near Panama City, before moving on to Tyndall Air Force Base, which sits on a spit of land projecting into the Gulf of Mexico and suffered a direct hit from the eye of the storm. The presidential party then moved on to southwestern Georgia, which suffered tremendous damage when struck by Hurricane Michael after it moved inland, still a Category Three storm. Like any major disaster, Hurricane Michael has laid bare the class contradictions in American society, showing how the social organism as a whole functions under conditions of colossal stress, in this case driven by natural causes, although, like all extreme weather events in the era of global warming, social processes are at work as well. 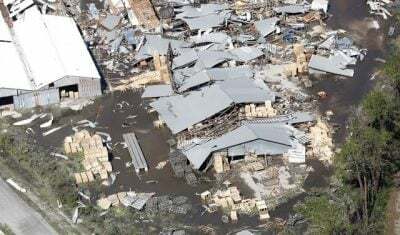 The official death toll is 18, similar to that declared for Hurricane Maria in Puerto Rico at the time Trump made his notorious visit to the island last year, when he was filmed throwing rolls of paper towels to a crowd of survivors, and boasted that the low death toll showed that Puerto Rico had avoided a Katrina-like catastrophe. Subsequent studies have revised the death toll upwards enormously, to nearly 3,000, even greater than Katrina, mainly due to the prolonged cutoff of electrical power, in some areas as long as a year, which had a devastating impact on the survival rate among the sick and elderly throughout the island. The death toll may not increase as much in Florida, Georgia, North Carolina and Virginia, because of the more advanced economic conditions on the mainland as opposed to the island of Puerto Rico, but it could well rise into the hundreds. Some 1.8 million are still without electrical power in the region swept by Michael’s high winds and heavy rains. And the area devastated by the storm—the Florida panhandle, southeastern Alabama and southwestern Georgia—is already one of the poorest regions of the United States. In an indication of the likely undercounting, the official death toll in Mexico Beach, where Michael came ashore in Florida, remains at one, even though the town was completely obliterated, with only one sizeable structure intact in a town of about 1,200 year-round inhabitants, with facilities for as many as 15,000 residents during the summer tourist season. Town officials initially said that 285 people were unaccounted for because they had stayed behind during the storm, unable or unwilling to act on the evacuation orders from state and federal agencies. This number was lowered to 46 people missing, after accounting for those who left at the last minute, when Hurricane Michael’s rating was raised from Category Three to Category Four just before it made landfall. But that figure suggests that there may be dozens dead in Mexico Beach alone—a town that accounts for less than 0.3 percent of the population of the region directly hit by the storm’s fury. Nongovernmental organizations said that state and federal authorities were not allowing them to enter Mexico Beach and Panama City, the two worst-hit towns, slowing down significantly the process of finding the living and dead. Geaux Rescue, a Louisiana-based search-and-rescue group, said it had 433 requests from family members looking for loved ones in the two coastal towns, but could not act on them. While there is considerable official and media attention being paid to the coastal area most visibly devastated by the hurricane, the conditions inland are equally dire, and many of those who survived the storm find themselves trapped and completely isolated. This reality was demonstrated by a family who arranged downed trees to form the word “HELP” on the open ground in front of their home in rural Youngstown, northeast of Panama City. The appeal was sighted by relatives on an interactive map produced by the National Oceanic and Atmospheric Administration (NOAA)—an agency that has been targeted for savage budget cuts and gag orders by the Trump administration and its gang of climate-change deniers. A rescue team then cut through downed trees and reached the isolated home, rescuing three people. There are undoubtedly dozens if not hundreds of such families at risk throughout the area hit by the storm. Florida Governor Scott, like Trump, is a climate-change denier. Under his eight-year administration, Florida state officials have been forbidden to use terms like “climate change” or “global warming” in official reports dealing with such phenomenon as beach erosion, the “red tide” catastrophe on the Gulf Coast, and more frequent and catastrophic weather events, all linked to the warming of the waters of the Gulf of Mexico and Atlantic Ocean. Whatever the death toll from the storm itself, the death toll from the aftermath began to rise with the shooting death in Panama City of an alleged looter by Florida State Fire Marshals. A dawn-to-dusk curfew is in effect throughout the disaster area, enforced not only by local police, but by 4,000 National Guard troops and another 2,200 federal troops. Conditions throughout the region are likely to deteriorate further once the national spotlight is removed. In Bay County, Florida, for example, where Mexico Beach and Panama City are located, every single public school building has been damaged, and schools are closed indefinitely for 26,000 children. Some buildings will require extensive repairs. Much of the population of the region lived in mobile homes before Hurricane Michael made landfall. Many of these were destroyed, in some cases picked up as in a tornado and flung long distances. There is also the spreading economic cost of the disaster. Much of southwest Georgia’s crop of sweet pecans and cotton was destroyed. Georgia is the second largest cotton-producing state, after Texas. Insurance companies have given an initial estimate of the insured losses at $6 billion to $8 billion, with projections that uninsured losses will be even greater. There are ample resources in American society to make good the losses of the working people and small businesses of the region, and to rebuild the housing stock and other structures in ways that will better resist the impact of severe storms. But under the control of the American capitalist class, these resources will never be made available to meet such social needs, because there is no profit to be made. The sums required for hurricane relief and rebuilding are dwarfed by the hundreds of billions squandered on the US military machine. Tyndall Air Force Base alone, with its armada of 55 F-22 “Raptor” stealth fighter jets, each one purchased at a cost of $339 million, accounts for $18.6 billion in federal spending—more than the estimated cost of all the damage caused by Hurricane Michael.